I'll still be working on the brass tube extruder, but I'm going to get a few Mendels working first, with technology I know is reliable. I use this method too. Especially for drilling out pinch wheels to the right diameter for a stepper motor's axis. Sometimes it's a bit risky though. 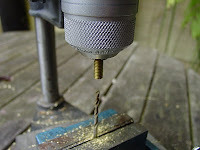 It can also grab the drill and screw itself onto it towards the vice until the motor stops. This can be quite a violent event. Be sure to keep one hand on the off switch. I usually have one hand on the trigger, making the drill go slowly so that the shavings curl out neatly. Not had it run away on me yet!